Academy Gardens is a neighborhood located in Far Northeast Philadelphia. It is located on the eastern side of the Far Northeast. 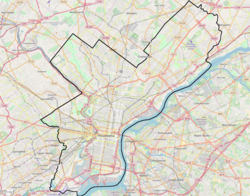 Its approximate boundaries are Pennypack Park, Grant Avenue, the John F. Byrne Golf Course, and Holme Avenue. Originally farm land, it was part of the holdings of Thomas Holme, surveyor for Pennsylvania's founder, William Penn. The zip code is 19114. Academy Gardens was settled in earnest by veterans of World War II during the dramatic expansion of the Northeast. This area was once part of Bucks county. Route 1 Roosevelt Blvd was once Bensalem avenue. The Penny Pack creek was the boundary line. Many of the homes were inexpensive "starter homes" that were largely unfinished to constrain cost. These homes have been extensively remodeled over the years and now largely belie their humble origins. Penn-Academy and Crispin Gardens are the local youth sports organizations. There is little industry but a fair amount of retail trade in the neighborhood, mainly along Willits Road and Holme Avenue. Former prominent residents include Thomas Holme. This page was last edited on 19 February 2019, at 10:19 (UTC).